Workplace fires happen more often than people realize. Some businesses, unfortunately, doesn’t recover from the destruction of their building. Don’t let this happen to you. A workplace has a lot of important documents and files that need saving — equipment matters as well such as office furniture, and computers. More importantly, your employees’ lives matter more than any material object. All of these things can be lost or damaged if a fire breaks out. This occurrence may seem rare, often making employees underprepared as far as what to do in this type of emergency. Workplace fires happen more often than people realize. Some businesses, unfortunately, doesn’t recover from the destruction of their building. Don’t let this happen to you. 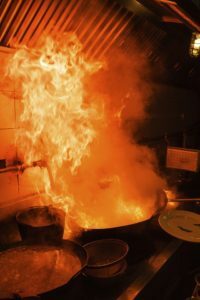 Keep reading for tips that will prevent a commercial fire. When a building has faulty electrics, this can lead to a commercial fire. To aid in fire protection, make sure that your workplace doesn’t have frayed wires, broken or damaged plugs, old sockets, or overloaded power sources. Faulty wiring is a safety hazard that you should not ignore. A desk or carpet could set a fire just by one stray spark alone! In the workplace setting, discarded piles of paper could come into contact with an overheated plug. Only one item touching a defective plug may lead to a commercial fire. Make sure that your electrics comply. Every workplace or building should have routine maintenance checkups. Methods for commercial fire protection include making sure that your plugs aren’t crowded, too hot, or have shorts. Also, make sure that your wiring isn’t frayed or damaged in any way. Combustible products should not come in contact with electrics, especially if they tend to overheat. Make sure that all the equipment within your office, let’s say a microwave, does not have a high, dangerous amount of volts or watts. Make sure that all electronic equipment is installed correctly with compliance in mind. Combustible dust could cause a commercial fire to occur. Wood, plastic, metal, and food such as flour cause dust to accumulate. If any of these materials ignite, an explosion happens. So what can you do to help with fire protection and prevention? Ventilating these areas helps as well as cleaning and use a vacuum to collect the combustible dust. This entry was posted on Thursday, March 28th, 2019 at 9:39 am. Both comments and pings are currently closed.